You wouldn’t think the female menstrual cycle would be at the top of Nigel Farage’s list of pressing concerns right now but it appears he’s been giving the matter some serious thought, presumably when taking breaks from talking about why immigration is A Very Bad Thing. Farage’s party UKIP has announced it will get rid of the “period tax” on women’s sanitary products if it is elected following the General Election on May 7. 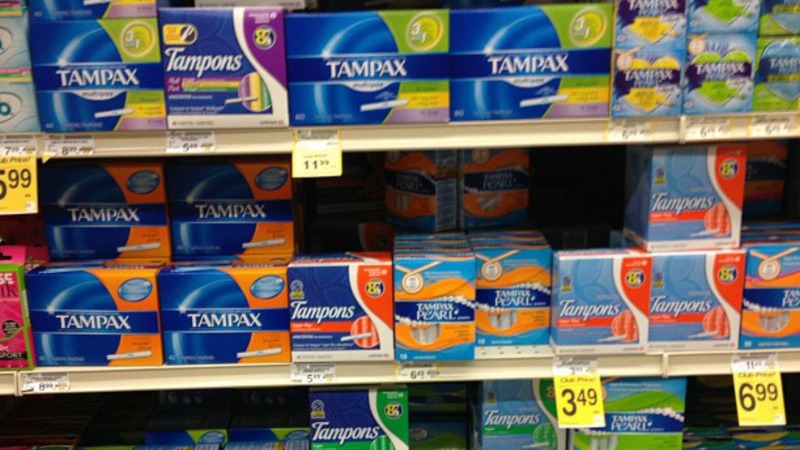 “Taxing tampons is straight out of the dark ages. It is a hangover from a distant past when policymakers disregarded the interests and health of woman and it must not be allowed to continue,” said Suzanne Evans, UKIP’s head of policy. It’s not as bad as it used to be. Before 2001 the tax on sanitary products such as tampons and pads was 17.5 percent. After a lot of campaigning the then-Labour government reduced the tax to the current rate of 5 percent, which is the lowest possible option under EU law. For women’s sanitary products to be exempt from tax all 28 EU member states would have to agree — which means it is possible without leaving the EU (and/or voting UKIP), just pretty tricky. Ending the tax on sanitary products would only save each woman a few quid each year but it’s an important campaign on the basis that it’s an outdated tax, put in place by a male-dominated parliament in 1973 who clearly thought sanitary products weren’t essential. Let’s hope whatever the outcome of the election on May 7 this outdated tax will ultimately be removed.